I was awakened about 3:00 this morning by the severe storms that moved through the area. Heavy wind, hail, and some heavy rain. It slowed up and I fell back to sleep and then around 5:00 this morning the next round came through. We had some trees down and flooding in the area, no damage around here though. So after all the excitement I woke up hungry! I prepared a couple of Jennie – O Turkey Breakfast Sausage Links, 1 Egg Sunny Side Up, 2 slices of toasted Healthy Life Bread, and a cup of Bigelow Green Tea. Not a bad way to start the day! After Breakfast did a load of laundry. After that I ran the vacuum, and dusted (hate dusting). After Lunch I headed over to spend the afternoon with Dad at the rehab center, he’s being released on the 28th of this month. Been 2 months since he’s been home. For dinner tonight it’s Blackened Gulf Coast Grouper w/ Baked Fingerling Potatoes and Cut Green Beans. I’m using the Florida Gulf Coast Grouper my friends dropped off to me yesterday on their return from Florida. It’s another one of those beautiful Grouper fillet! To prepare it I rinsed the fillet off in cold water and patted it dry with paper towel. Then I cut it into smaller pieces. I then seasoned them it with a bit of Sea Salt. Then I melted 1 tablespoon of Blue Bonnet Lite Butter and rolled the fillet in the Butter. I then added the Zatarain’s Blackening Seasoning, coating both sides of the fillet. I prepared it in a preheated Cast Iron Skillet that I sprayed with Pam Cooking Spray. When the pan was fully heated, on medium heat, I added my Grouper. At this point turn on your Stove Overhead Exhaust Fan on, because it will start smoking from the seasoning. Cooked it about 4 minutes per side, and it was ready! Cast Iron Skillets are perfect to use for any cooking but especially when you Blacken something. The Skillet heats up and holds it heat and the heat evenly distributes across the Skillet, perfect for Blackening Meats. This is one delicious Grouper! The fresh taste of the Grouper, so meaty, along with the Blackening Season are a perfect combo. Love Fish, Love Seafood! Plus as you can tell as big as this filet was I only had half of it for dinner. The other half for lunch tomorrow! Then I also Baked some Fingerling Potatoes, picked up a bag at our local Kroger. They come in a small bag, Melissa’s Fingerling Potato Medley. It’s a variety of 4-5 different Potatoes including Fingerling Potatoes, which I love using! To prepare them I started by washing the Potatoes off in cold water. I then cut the Fingerling Potatoes in half, lengthwise. Put the Potatoes in a large bowl seasoned them with; Extra Virgin Olive Oil, Garlic Powder, Sea Salt, Pepper, Chili Powder, and Kraft Reduced Fat Parmesan Grated Cheese to top the Potatoes with. Using a cookie sheet lined with foil I spread the Potatoes out on the sheet . Then Roasted them at 400 degrees until they were fork tender, about 20 minutes. Love those Potatoes! Perfect side dish for any dinner, especially Fish. Then I also heated up a small can of Del Monte Cut Green Beans. I also baked a loaf of Pillsbury French Bread. For dessert later a Skinny Cow Chocolate Truffle Ice Cream Bar. Made a Ham, Egg White, Whole Grain English muffin Breakfast Sandwich this morning to start my day off. Outside it’s another rainy, gloomy, cold windy day out. Sure would like to see the sun for an entire day. So since it’s not a good day to be out I used the time inside to give my Hoveround Mobility Chair a good cleaning. Took parts off so I could clean the entire chair. Did some light cleaning after that. For dinner tonight I prepared a Jennie – O OVEN READY™ Boneless Skinless Turkey Breast w/ Mashed Potatoes, Italian Cut Beans, and Baked French Bread. 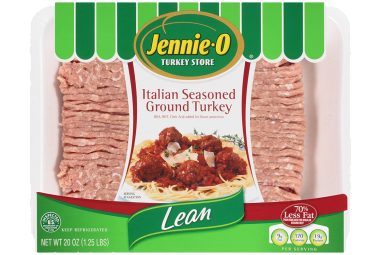 I used the Jennie – O Oven Ready Skinless Boneless Turkey Breast that Jennie – O had sent me just before Christmas, as a member of their Switch Club. Such an easy way to have a moist and fantastic tasting Turkey, along with little clean-up! Comes in a Jennie O turkey Breast Oven Ready Bag, that you bake at 375 degrees for about 2 to 3 hour until it reads 165 degrees. It also now has a pop up inserted in the breast that pops up when done. The Turkey comes out moist, juicy and delicious, with an excellent flavor! So cooking usually for just myself and my parents, it’s just the right size (2-3 lbs.). Enough leftover for some great Turkey Sandwiches! For one side I made some of my favorite Mashed Potatoes, Bob Evans Mashed Potatoes. Just microwave for 6 minutes and serve. Just as good as homemade, if not better. Then for another side dish I heated a can of Allens Cut Italian Green Beans. To prepare them just empty the can into a small sauce pan and simmer until heated. Just season with a bit of Sea Salt and it’s ready! I could have Beans every day and never get tired of having them. Finally I baked a loaf of Pillsbury French Bread, family’s favorite baked bread. For dessert later a Skinny Cow Chocolate Truffle Ice Cream Bar. Cold day outside here so I heated up the Kitchen and tried a new recipe, Sausage Crescent Cheese Balls from Pillsbury. Found this recipe in a cooking magazine, sounded good so I thought I would give it a try. I had actually tried this recipe last year about this time but I used Jennie – O Ground Turkey Breakfast Sausage. So this time I’m going with original recipe and using Spicy Sausage, I used Bob Evan’s Zesty Hot Pork Sausage. For my other ingredients I used Pillsbury Reduced Calorie Crescent Rolls and Sargento Reduced Fat Shredded Sharp Cheddar Cheese. Both which cut back on calories, fat, and carbs. To prepare them, heat oven to 375°F. Then line 15x10x1-inch pan with foil; spray with cooking spray. In large bowl, mix sausage, cheese and rosemary; mix well using your hands or spoon. Unroll crescent dough on work surface; coat each side of dough with 1 tablespoon flour. Using pizza cutter or knife, cut dough into about 1/4-inch pieces. Mix crescent dough pieces into bowl of sausage mixture in small amounts until well blended. Shape the mixture into 42 (1 1/4-inch) balls. Place in pan. Bake 15 to 17 minutes or until golden brown. You can eat these just as they are or serve them with some French’s Spicy Brown Mustard, which worked well with it. The Sausage Crescent Cheese Balls turned out delicious! They had a really good Spicy flavor, not over powering just right. This will make a perfect Christmas or New Year’s appetizer for your family and friends gatherings! The original recipe and the Pillsbury web link is at the end of the post. * Heat oven to 375°F. Line 15x10x1-inch pan with foil; spray with cooking spray. * In large bowl, mix sausage, cheese and rosemary; mix well using hands or spoon. * Unroll crescent dough on work surface; coat each side of dough with 1 tablespoon flour. Using pizza cutter or knife, cut dough into about 1/4-inch pieces. Mix crescent dough pieces into bowl of sausage mixture in small amounts until well blended. * Shape mixture into 42 (1 1/4-inch) balls. Place in pan. Bake 15 to 17 minutes or until golden brown. Serving Size: 1 Cheese Ball Calories60 Calories from Fat40 % Daily Value Total Fat4g6% Saturated Fat2g10% Trans Fat0g0% Cholesterol10mg3% Sodium110mg5% Total Carbohydrate3g1% Dietary Fiber0g0% Sugars0g0% Protein2g2% % Daily Value*: Vitamin A0%0% Vitamin C0%0% Calcium2%2% Iron0%0% Exchanges:0 Starch; 0 Fruit; 0 Other Carbohydrate; 0 Skim Milk; 0 Low-Fat Milk; 0 Milk; 0 Vegetable; 0 Very Lean Meat; 0 Lean Meat; 0 High-Fat Meat; 1 Fat; Carbohydrate Choice0 *Percent Daily Values are based on a 2,000 calorie diet. Started off with breakfast, workout, and shower. Cooler outside today after 68 degrees yesterday. Rain on and off almost all day. So not much going on outside, stayed inside and cleaned the house today. Had to have the repairman we always use to come and do for work for us today also. We had a kitchen drawer break its slider bracket and we had to have the heating tape for our waterline replaced. It seems lately it’s always something, be it the house or car that needs repaired! 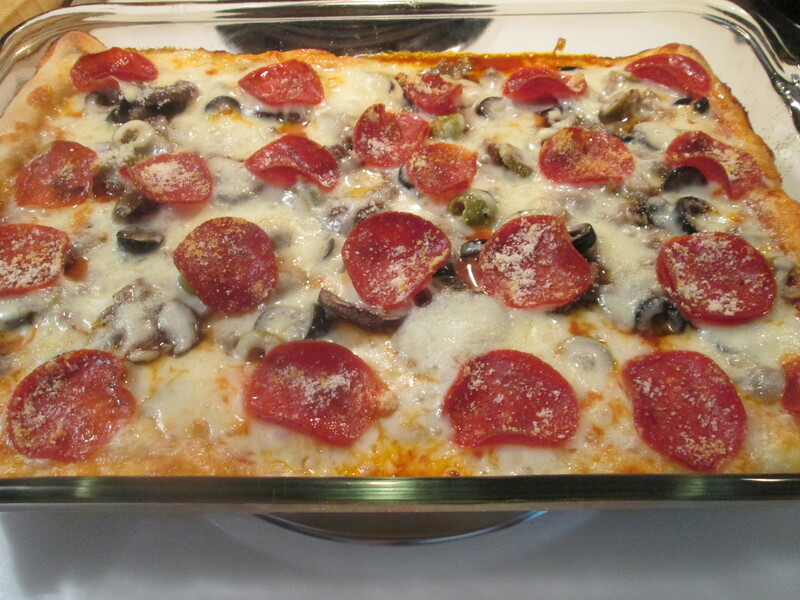 For dinner tonight a new recipe, Pepperoni Pizza Bake. Came across this Pillsbury recipe and one other in a cooking magazine and couldn’t wait to give them a try. 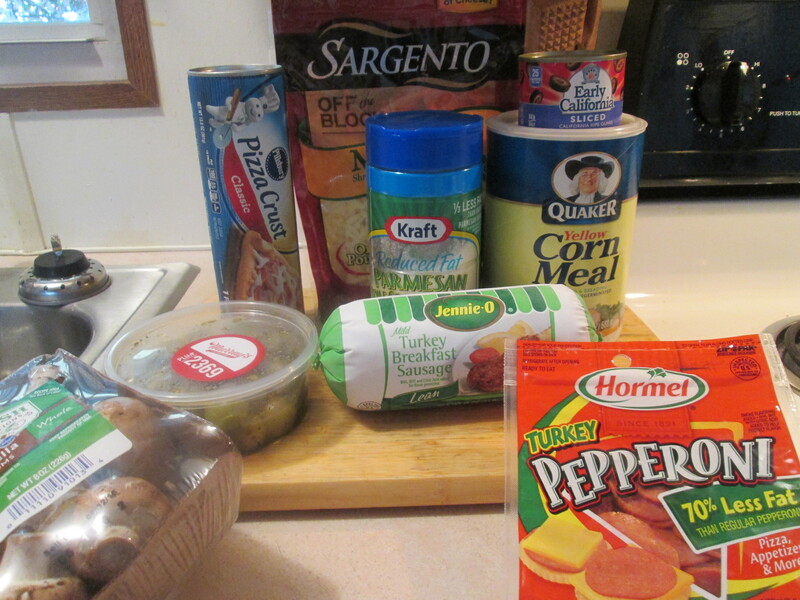 I’m preparing the Grands Pepperoni Pizza Bake, I’m saving the other recipe for later (Sausage Crescent Cheese Balls). 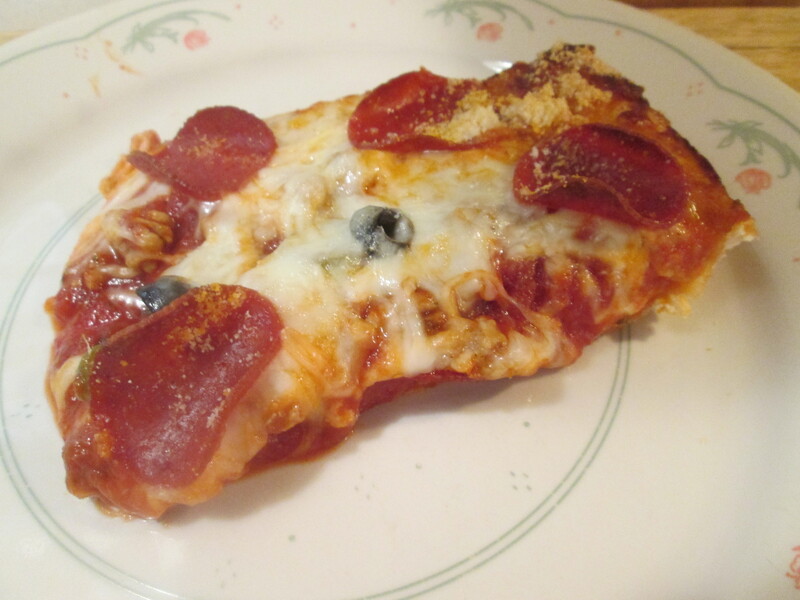 To make this dish I’ll need just 4 ingredients; 1 can (16.3 oz) Pillsbury™ Grands!™ Homestyle refrigerated original biscuits, 1 can (8 oz) pizza sauce, 2 cups finely shredded mozzarella cheese (8 oz), and 16 slices pepperoni (1 1/2 inch). I used Ragu Homestyle Pizza Sauce, Hormel Turkey Pepperoni, and Sargento Shredded Mozzarella Cheese (Traditional Cut). To prepare the dish I started by heating the oven to 375°F. Sprayed 13×9-inch (3-quart) baking dish with Pam with Olive Oil Cooking Spray. Separate the dough into 8 biscuits. Cut each biscuit into 8 pieces. Then in large bowl, toss with biscuit pieces, pizza sauce and 1 cup of the cheese.Top with pepperoni and remaining 1 cup cheese. Baked for 23 minutes, and the biscuits were golden brown. The dish turned out incredible! Just a fantastic combination of 4 ingredients that work together. The Pillsbury Grands Biscuits gives it that Pizza texture and taste. 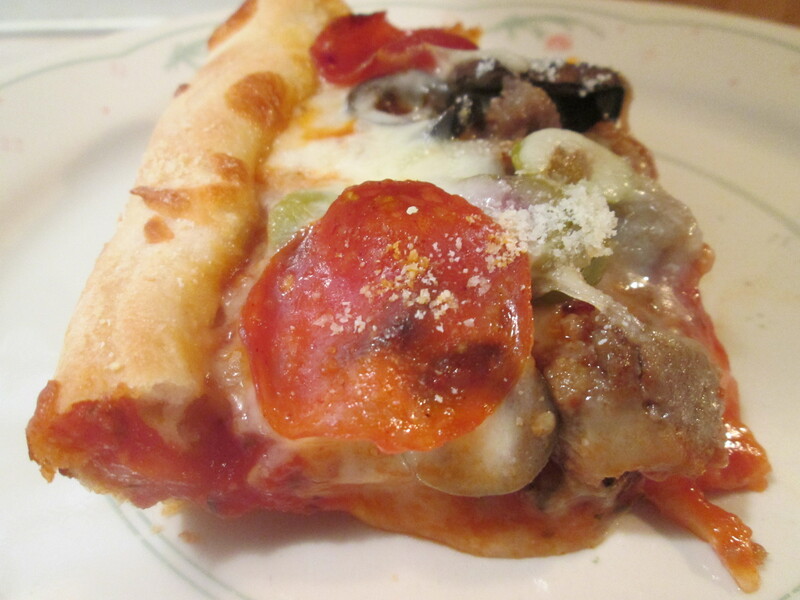 You could add Mushrooms, Sausage or any of your favorite Pizza toppings to the dish. I’ve left the original recipe and web link at the end of the post. For dessert later a Jello Sugar Free Dark Chocolate Mousse. Heat oven to 375°F. Spray 13×9-inch (3-quart) baking dish with cooking spray. Separate dough into 8 biscuits. Cut each biscuit into 8 pieces. In large bowl, toss with biscuit pieces, pizza sauce and 1 cup of the cheese.Top with pepperoni and remaining 1 cup cheese. Bake 20 to 23 minutes or until biscuits are golden brown. Serving Size: 1 Serving Calories440 Calories from Fat220 % Daily Value Total Fat24g37% Saturated Fat11g56% Trans Fat4g4% Cholesterol40mg13% Sodium1420mg59% Total Carbohydrate37g12% Dietary Fiber0g0% Sugars9g9% Protein19g19% % Daily Value*: Vitamin A6%6% Vitamin C0%0% Calcium35%35% Iron15%15% Exchanges:2 Starch; 0 Fruit; 1/2 Other Carbohydrate; 0 Skim Milk; 0 Low-Fat Milk; 0 Milk; 0 Vegetable; 0 Very Lean Meat; 0 Lean Meat; 0 High-Fat Meat; 2 1/2 Fat; Carbohydrate Choice2 1/2 *Percent Daily Values are based on a 2,000 calorie diet. Woke up ready for Breakfast this morning! I prepared an Egg Beater Egg White Scrambled Egg, 2 Jennie – O Turkey Breakfast Sausage Links, 2 slices of toasted Aunt Millie’s Whole Grain Bread, and a cup of Bigelow Decaf Green Tea. Fantastic Breakfast to start my day! Not quite as windy as yesterday but there’s still a brisk wind out there. A high only in the 40’s today, partly sunny. After Breakfast I went to Meijer and stopped by Kroger for groceries. From there stopped by the bank for Mom and back home. I had been wanting some Ravioli so tonight that’s what I had. Tonight I prepared Cheesy Ravioli in Tomato And Cheese Sauce w/ Baked French Bread. It had been quite a while since I’ve had Ravioli and decided tonight was the night to have some! I used Annie’s Homegrown, Cheesy Ravioli in Tomato and Cheese Sauce. I used to have a couple of cans of this in the pantry and have it for lunch. Ran out sometime back and bought a few cans of it while at Kroger earlier today. It comes in a can so to prepare it; just empty contents into medium saucepan. Heat over medium heat, stirring occasionally until hot. And it’s done! Doesn’t get much easier than that. Delicious, easy to prepare, and 1 sauce pan to clean. Nice size Ravioli, good tasting Tomato and Cheese Sauce, and love the Cheese that’s in the Ravioli. Makes a good hot meal. And it’s only 180 calories and 28 net carbs per serving. I topped it with a sprinkle of Basil and Shaved Parmesan Cheese. I’ve left the product info at the end of the post. To go with the Ravioli I baked a loaf of Pillsbury French Bread. Also had a Half and Half Diet Snapple to drink. For dessert later a Skinny Cow Chocolate Truffle Ice Cream Bar. * Heat and eat. Easy and cheesy! Inside this can are cheese-filled “pillows”, as our daughter calls them, floating in a rich palate-pleasing tomato and cheese sauce. They are quick and easy to prepare, delicious, and a healthful alternative to conventional pasta meals. Bernie’s Cheesy Ravioli is made with premium quality ingredients using our own organic wheat and organic cheddar cheese. It’s a healthier choice for you and your family and a healthier choice for our planet. Thank you for your enthusiasm for Annie’s products and for your suggestions. Your good wishes come in the form of email, thoughtful letters, photos, and imaginative drawings, and we cherish them all. As always, we are listening and we want to know what you think of our latest comfort food in a can. Peace, All of us at Annie’s. Stove: Empty contents into medium saucepan. Heat over medium heat, stirring occasionally until hot. Makes 2 cups. Microwave: Empty contents into microwave-safe dish. Cover; microwave on high 2 minutes, or until hot. Stir before serving. Refrigerate any unused Cheesy Ravioli immediately in a separate container. Water, organic tomato puree (water, organic tomato paste), organic wheat flour, organic cheddar cheese ([organic pasteurized milk, cheese cultures, salt, enzymes], water, salt), organic evaporated cane juice, organic brown rice flour, organic rice starch, sea salt, organic mustard flour, organic corn starch, organic onion powder, citric acid, organic garlic powder, organic paprika, organic spice. Started my day off with a couple of Egg’s Low Fat Waffles, topped with I Can’t Believe It’s Not Butter. After my morning workout did a little house cleaning and on to the outside cleaning. A lot of leaves around the car port and driveway. It’s a beautiful Last Day of Summer outside! The first day of Fall is tomorrow. The year has flown by. After I had all the cleaning done I got the cart out and rode around the neighborhood and spent some time down by the lake. 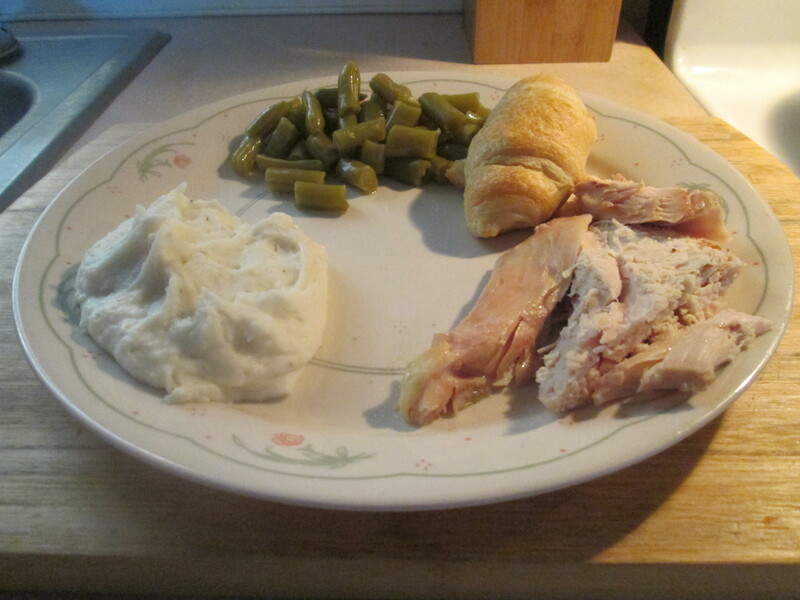 For dinner tonight I prepared a Baked Bone-In Whole Chicken Breast w/ Mashed Potatoes, Canned Green Beans, and Crescent Rolls. I picked The Perdue Chicken up at Kroger yesterday. 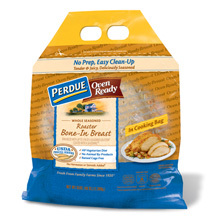 My favorite bagged Chicken, the PERDUE® OVEN READY Whole Seasoned Roaster Bone-In Breast. As it says “Baked Bone-In Whole Chicken Breast Oven Ready”, already seasoned, and little clean-up needed afterwards. To prepare it just preheat the oven to 400ºF. Cut open outer bag and remove Oven Ready Roaster Bone-In Breast, sealed in a cooking bag. Place in a shallow roasting pan, seasoned side up. Cut one small 1″ slit in cooking bag over the breast to vent during cooking. If cooking from Fresh: Place pan with breast (still in cooking bag) on lower shelf of oven and roast for approximately 80-90 minutes, until internal temperature of the breast reaches 180ºF. Comes out piping hot, well seasoned, and delicious! Plenty leftovers for some Chicken Sandwiches or Burritos! 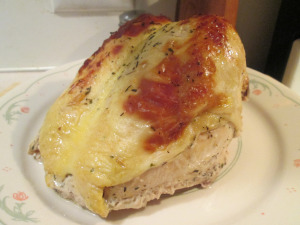 Such an easy way to have an excellent Baked Chicken Dinner! For one side I made some of my favorite Mashed Potatoes, Bob Evans Mashed Potatoes. Just microwave for 6 minutes and serve. Just as good as homemade, if not better. 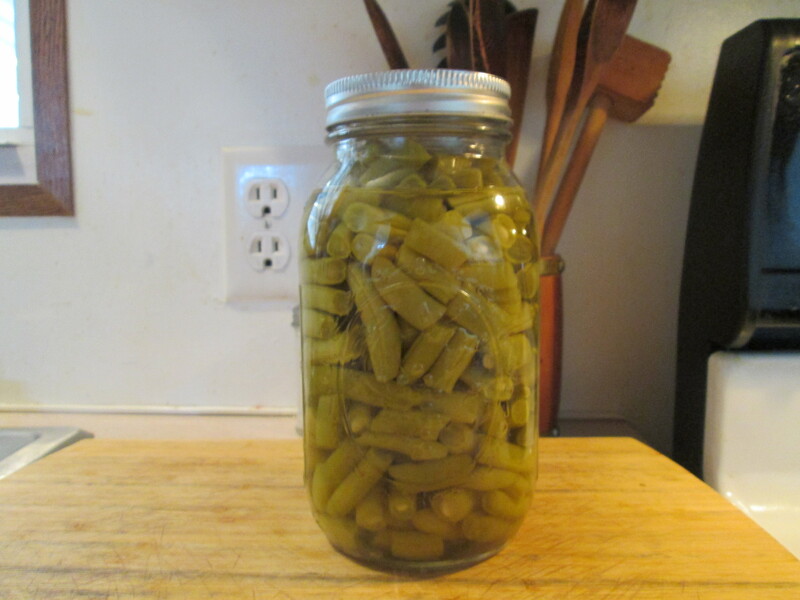 Then I opened up a Mason Jar of our Canned Green Beans, canned last summer. Love these Beans, they taste just as fresh as the day we bought them. I also baked a loaf of Pillsbury Rustic French Bread, Mom’s favorite. For dessert later tonight a Healthy Choice Frozen Dark Fudge Swirl Frozen Greek Yogurt. *Ingredients: Chicken, water, salt, potassium and sodium phosphates, brown sugar, dextrose, carrageenan, yeast extract, maltodextrin, natural flavor. *Seasoning Ingredients: Dextrose, modified food starch, onion, maltodextrin, natural flavor, garlic, cottonseed oil, dried carrot, xanthan gum, dried parsley, calcium chloride, potassium chloride, carrageenan. • Preheat oven to 400ºF. Cut open outer bag and remove Oven Ready Roaster Bone-In Breast, sealed in a cooking bag. Place in a shallow roasting pan, seasoned side up. • Cut one small 1″ slit in cooking bag over the breast to vent during cooking. Note: Cooking bag will expand during cooking; allow enough room for the bag to expand without touching oven rack or walls. • Cook from Fresh: Place pan with breast (still in cooking bag) on lower shelf of oven and roast for approximately 80-90 minutes, until internal temperature of the breast reaches 180ºF. ** • Cook from Frozen: Place pan with breast (still in cooking bag) on lower shelf of oven and roast for approximately 2-1/3 to 2-1/2 hours until internal temperature of the breast reaches 180ºF. ** • Remove from oven and let stand for 10 minutes. Cut open cooking bag (use care to avoid hot steam and juices) and transfer breast to serving plate or cutting board. Remaining juices in bag can be used for a delicious seasoned gravy. **If breast temperature is below 180ºF, return to oven and continue cooking, checking the temperature every 10 minutes until the temperature reaches 180ºF. We have the hazy, hot, and humid weather back! Awfully humid out there today. Had a bowl of Kroger Brand Bran Flakes for Breakfast. Ran a quick errand for Mom and back home for the day. Finished up some laundry for her and did some outside cleaning before it got too humid out. After that it was “Sofa City” after that, just my easy chair and remote for the afternoon. 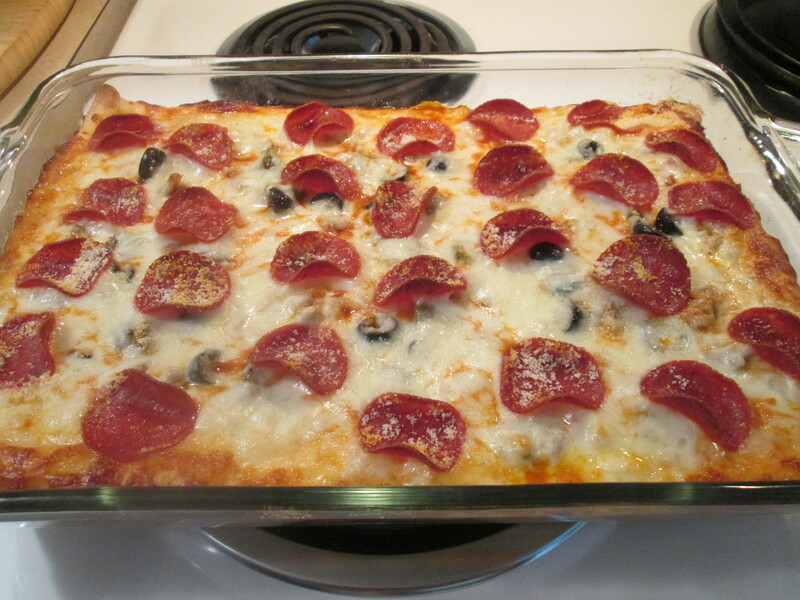 For dinner tonight I prepared a Deep Dish Pizza Casserole. I had made this a couple of weeks ago and everybody loved it! So I’m preparing it again for dinner tonight. To make this Pizza I’ll need the following: 1 (13 ounce) Pillsbury™ Refrigerated Pizza Crust, 1 1/2 cups Ragu Pizza Sauce, Jennie – O Lean Ground Turkey Breakfast Sausage ( 1 lb. package and precooked) , Sliced Black and Green Olives, Sliced Mushrooms, 2 1/2 cups of your favorite cheese (I like using Sargento Reduced Fat Shredded Italian Blend Cheese or Sargento Reduced Fat Shredded Mozzarella Cheese), Hormel Turkey Pepperoni, and 1/3 cup Kraft Reduced Fat Grated Parmesan Cheese. To start I fried the Ground Turkey, till no longer pink, and sliced the Olives. Then to prepare the dish I preheated the oven to 425°F. Greased a 9×13 inch baking dish with Pam Cooking Spray w/ Olive Oil and sprinkled Corn Meal across the bottom of the dish. I like using the Corn Meal when making Pizza, the Corn meal on the bottom of the crust gives it nice texture and helps keep it from sticking to the dish or pan. I unrolled the Pillsbury Pizza Dough, and pressed it into the bottom and halfway up sides of prepared baking dish. 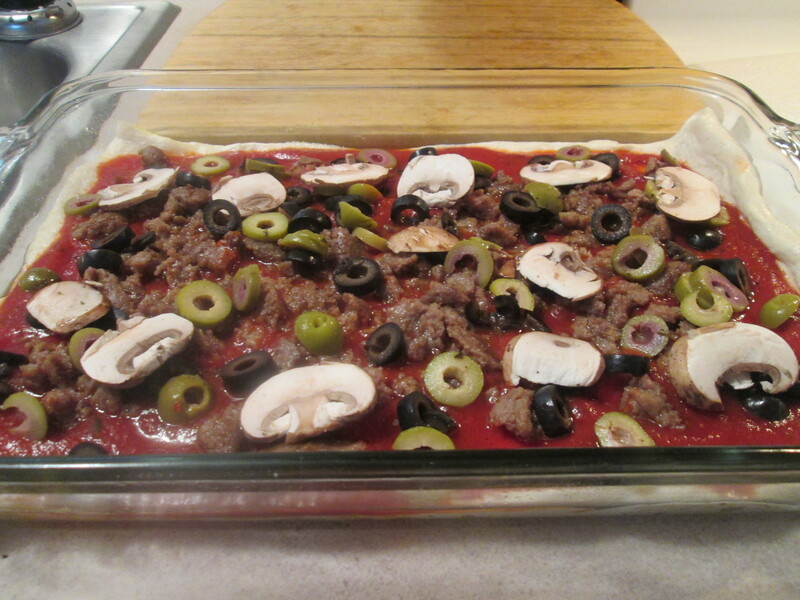 Then spread the dough with the Ragu Pizza Sauce, and then sprinkle the cooked Jennie – O Ground Turkey and Sliced Mushrooms, and the Sliced Olives over the top. Cover the Pizza with Cheese and then top with Turkey Pepperoni. Sprinkle the Parmesan over top. Bake for 15-20 minutes or until crust is golden brown and the Cheese is melted. Remove from the oven and sprinkle with more Parmesan. And we have a Deep Dish Pizza Casserole. I’ll start off by saying this is one of those Keeper Recipes and already a family favorite! The crust came out a perfect golden brown. And all the toppings combined to make it one delicious Pizza. Plus you can use what ever toppings you want for this. Mom and Dad both said it was one of the best Pizzas they had ever had, so it’s Parent Approved! For dessert later a Jello Sugar Free Dark Chocolate Pudding. 1 – Preheat oven to 425°F. Grease a 9×13 inch baking dish with cooking spray or olive oil. 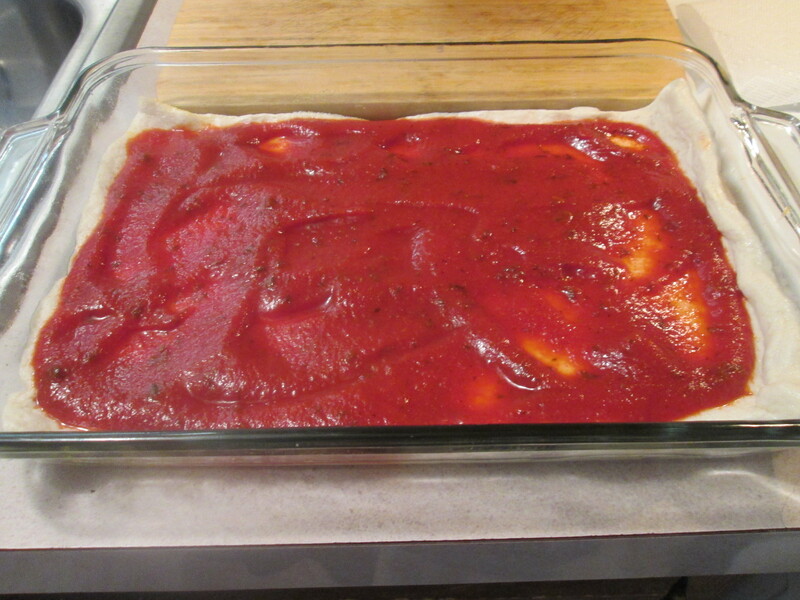 2 – Unroll the pizza dough, and press it into the bottom and halfway up sides of prepared baking dish. 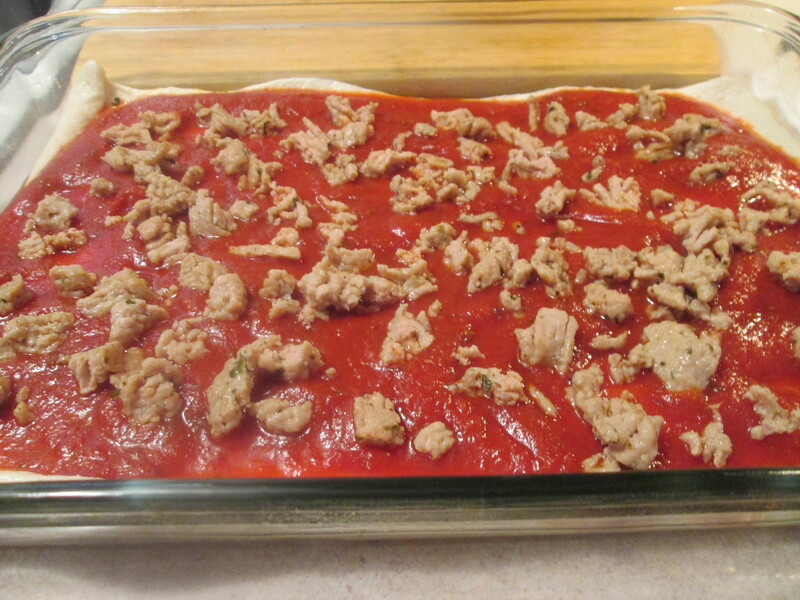 3 – Spread the dough with some pizza sauce and, if using, sprinkle the cooked spicy Italian sausage over the top. Cover the pizza with cheese and then top with pepperoni (if using). Sprinkle the Parmesan over top. 4 – Bake for 15-20 minutes or until crust is golden brown and the cheese is melted. Remove from the oven and sprinkle with more Parmesan if desired. Serve immediately. It was a beautiful Summer Morning here in West Chester. But watching the early morning news it was a bad day out on the inter-states. 3 major wrecks had 2 different interstates shutdown this morning, slow down people and take your time! After a light Breakfast I ventured out to Meijer, went for just a few items and ended up with a cart full! Luckily I didn’t need gas, gas prices shot up over $3 a gallon overnight! Back home finished up a couple of loads of laundry for Mom and did some cleaning around the house. With everything done got the cart out for a while to enjoy the day. 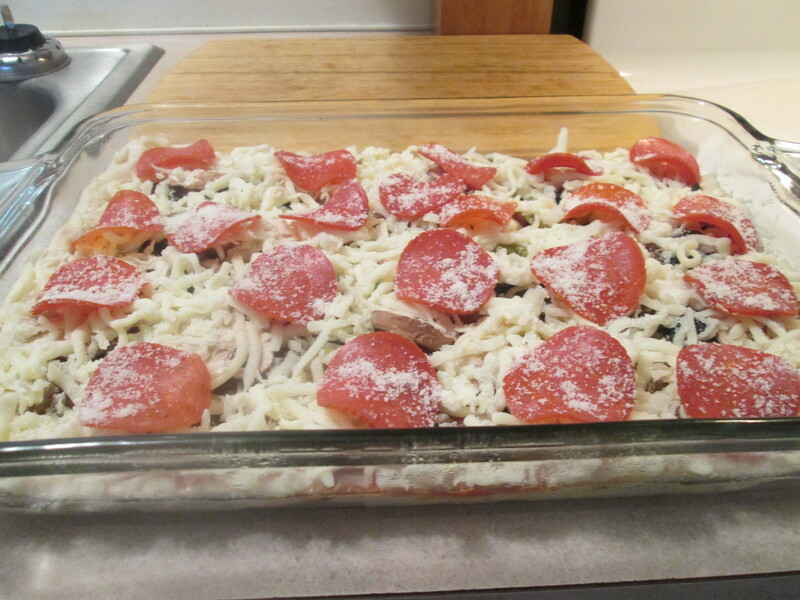 For dinner tonight I prepared a new recipe, Deep Dish Pizza Casserole. To prepare the dish I preheated the oven to 425°F. Greased a 9×13 inch baking dish with Pam Cooking Spray w/ Olive Oil. I unrolled the Pillsbury Pizza Dough, and pressed it into the bottom and halfway up sides of prepared baking dish. 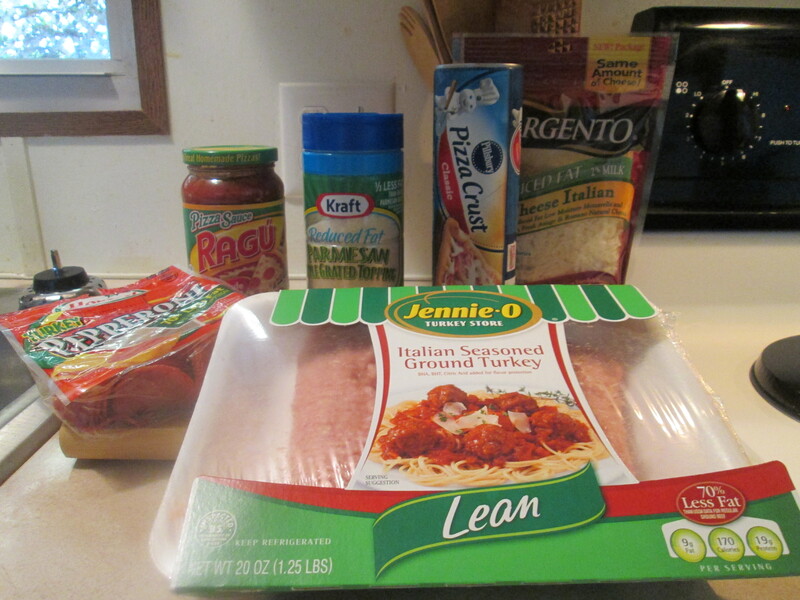 Then spread the dough with the Ragu Pizza Sauce, and then sprinkle the cooked Jennie – O Lean Italian Seasoned Ground Turkey over the top. Cover the Pizza with Cheese and then top with Turkey Pepperoni. Sprinkle the Parmesan over top. Bake for 15-20 minutes or until crust is golden brown and the Cheese is melted. Remove from the oven and sprinkle with more Parmesan. And we have a Deep Dish Pizza Casserole. I’ll start off by saying this is one of those Keeper Recipes! The crust came out a perfect golden brown. And all the toppings combined to make it one delicious Pizza. Mom and Dad both said it was one of the best Pizzas they had ever had, so it’s Parent Approved! For dessert later a bowl of Del Monte Sliced Peaches. Conveniently preseasoned ground turkey helps you save on pre time and contains 70 percent less fat than regular ground beef. It’s been one of those long days today. Dad fell again, in the house and he wasn’t hurt thankfully. Then I got a flat on my Hoveround Chair, luckily I had the new chair that I hadn’t used much yet. The new chair can’t even compare to the my old chair. My neighbors came over and changed the tire on my old one for me. So I got my old hoveround back up and running! 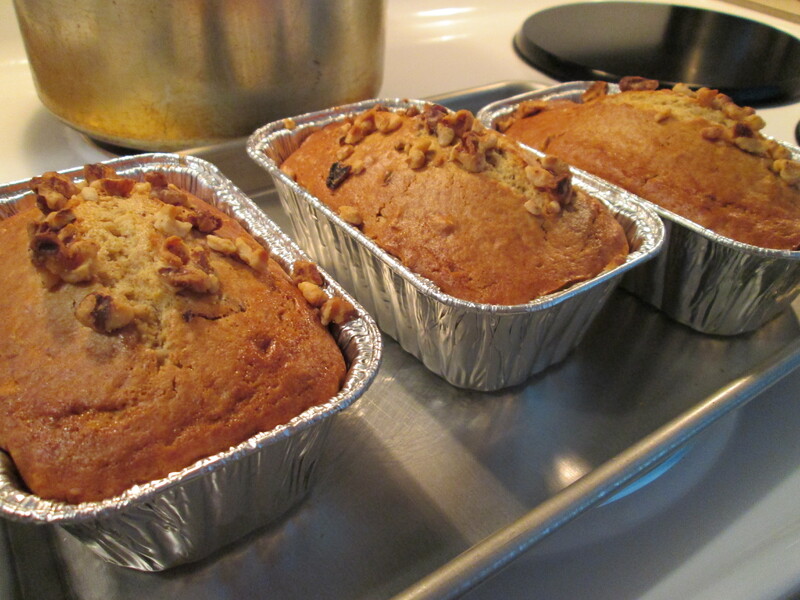 I had baked several Pillsbury Nut Quick Bread Loaves yesterday and took a couple of them over to my neighbors who are always there to give me a hand. I really get frustrated not to be able to do the little things, because I’m in a wheelchair. For 40 plus years I had both legs and used to do everything for myself, now I need help with a lot of things which is where the frustration sits in. But I guess you have to do what have to do to get things done. Sorry about the ranting! For dinner tonight I prepared a Sweet Italian Turkey Sausage w/ Pringle’s Fat Free Chips. 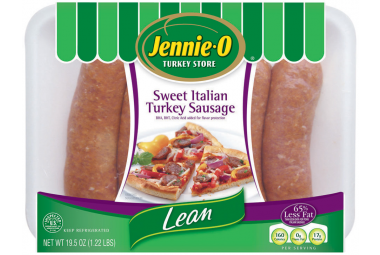 I used Jennie O Lean Sweet Italian Turkey Sausage. I pan fried it, using Pam Spray and no oil, a total of about 17 minutes. It fried up excellent, as all Jennie – O Products they have real good and fresh taste to them. They have 160 calories and 0 carbs per Sausage. Served it on a Kroger Lite Wheat Hot Dog Bun topped it with French’s Spicy Brown Mustard. To go with my Sausage I had some Pringle’s Fat Free Chips. *Note: Camera went on the blink as I was using it, picture shown one of my stock pictures with different chips other than the Pringle’s. For dessert later a slice of Pillsbury Nut Quick Bread. I had baked a few mini loaves of it yesterday. It comes with a small packet of Walnuts, but I still added some extra Chopped Walnuts to it. I added a small 1 cup serving Sugar Free Vanilla Pudding to it, the pudding gives all cakes an extra kick of moistness. I also used Egg Beater’s and Extra Virgin Olive Oil, replacing the Eggs and Corn Oil. Cut the calories where you can! * Lovers of sweet Italian sausage have found a perfect option. Place dinner sausages on grill rack 4 inches from heat source. Grill approximately 16 to 18 minutes, turning occasionally. Always cook to well done, 165 °F. as measured by a meat thermometer. Place dinner sausage in hot skillet. Cook covered, turning occasionally, 17 – 19 minutes.